Last year, Lonely Planet asked us to venture on their latest food and drink project— a Mexico centric cookbook. The cookbook is part of the ‘From the Source’ series and joins countries like Japan, Italy and France. Mexico’s book is divided into five regions: Mexico City and Central Mexico, Oaxaca, Pacific Coast, Baja California, Yucatán. I came onboard as the curator and voice for the entire Baja California recipe chapter. It includes ten recipes that best reflect the traditions, culture and cutting-edge culinary moment of Baja. With the collaboration of Caesar’s Restaurant, Sabina Bandera of La Guerrrense, Chef “Oso” Campos of Tras/Horizonte, Chef Krista Velasco of Wendlandt Brewery, Chef Roberto Alcocer of Malva, Chef Solange Muris of Manzanilla, Chef Adria Marina of Don Ramen, Chef Humberto Aviles, Chef Javier Plascencia of Misión 19 and Chef Diego Hernandez of Corazón de Tierra. They were all great and accommodating to work with! A huge thanks to all. As the recipes landed into my inbox, there may have been some salivating as I read through them. I feel fortunate to have enjoyed a majority of the dishes in person— I was more excited just thinking about having these recipes within arms reach, when the book would be published. Better yet, home cooks around the world can bring a taste of Baja to their own homes. From the traditional Ensenada style fish street tacos to smoked fish with oyster sauce and beetroot puree. The Baja chapter also includes classic dishes from the region like the Caesar salad, and captures today’s young chef influences. For us, it was important to focus on the significance of ingredient bounty that Baja offers. 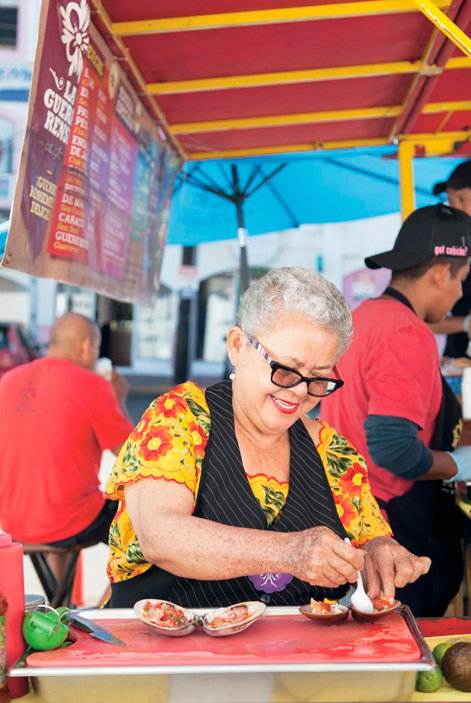 The street food, craft beer, winemaking, olive oil production, cheesemakers, farms and jewels from our oceans make Baja a food lover’s paradise. To paint the story, Lonely Planet enlisted the photo magic of Mexico City-based Lindsay Lauckner Gundlock. Over the course of 4 days, we visited each and every tastemaker from Tijuana, Ensenada and Valle de Guadalupe, to photograph each dish and chef. Lindsay created a beautiful narrative with her lens capturing the spirit of Baja for the cookbook. I’m joined by the company of fellow food and travel writers, Kate Armstrong, Scarlett Lindeman, John Hecht and Michele Peterson. Special thanks to Commissioning Editor Jessica Cole and all the Editors, for making it a great and fun project to work with. To dig deep into the book, you can purchase the book below!